Hand picked and precisely cut, these reeds are consistent, focused and last. 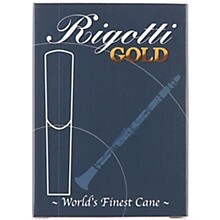 Rigotti Gold reeds represent the finest in precision and playability. Each box contains reeds that are very consistent due the use of sub-strengths light, medium, or strong. Box of 10. The cane is cut during a winter over four months from December to March. When the cane has reached maturity (after two years when it measures seven to eight meters tall with a diameter of 26cm to 32cm), it is cut and left in the open where it will be worked on. The work on the reeds is split into stages. Rigotti only keeps the 2 or 3 meters from the base (the rest is either burned or used as bamboo). They then cut (from the base to the top) the tubes and throw away the knots to obtain tubes suited to music. This is where the true work starts. Each tube is calibrated to a particular instrument. Give Rigotti Gold Reeds a try today. Order now!